You may already recognize the need for integrating your Enterprise Resource Planning (ERP) Application with your ecommerce store, but you should understand that not all integration methods are the same. While some integration methods permit periodic updates to your online and in-store data portals, others allow you to disseminate product and organizational information in real time. If you are using the powerful Magento platform to support your ecommerce operations, then real time integration with your ERP system can be seamlessly implemented. What is Real Time Integration? Real time integration is the automatic distribution and updating of data to all consumer and organizational data portals as soon as your enterprise acquires it. This means that your in-store and online operations receive the most current product and operational information as soon as it becomes available. Why is Real Time Integration Important? 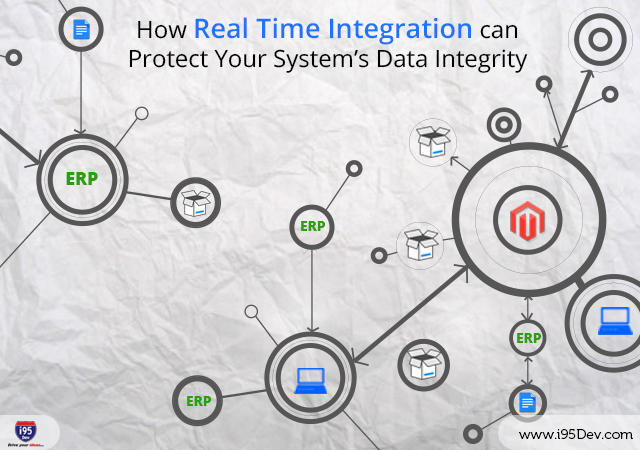 Real time integration provides added accuracy and eliminates redundancy in your ERP system. The ability to access the latest product, shipping, or availability information is a feature that will make the customer experience more enjoyable and limit costs due to returns and diminished customer loyalty. Real time integration also eliminates the need to manually correct outdated or inaccurate information, which can lead to errors. The importance of real time integration lies in its ability to eliminate incorrect data and the need for manual intervention. Consider how a customer may log into Ecommerce Site in an attempt to alter his or her shipping details. In a schedule-based system, this information is updated only when the ERP system is synced at the scheduled interval. There is a lag between the input of customer preferences and the introduction of this information into the ERP system before both ends reflect the correct data. If the ERP administrator modifies the same customer record at their end at some later point, then the ERP system must again wait until the next scheduled sync point before the ERP system possesses the latest and most accurate information. Consider, however, if both the customer and the ERP administrator enter changes to the same customer record simultaneously. At the next sync point, when the customer-initiated changes and the administrator-initiated changes there is a conflict which can produce inaccurate data at the e-commerce storefront, the ERP data system or both. In order to eliminate these issues, i95Dev has developed a real time integration solution that heightens efficiency, improves accuracy and strengthens your brand’s performance. How Real Time Integration Works ? A customer logs into Ecommerce Site to modify his or her shipping preferences. Once this information is entered, it automatically and immediately is submitted to the ERP system, thus ensuring that the correct information is available at the storefront and within the enterprise network. If, however, both the customer and the ERP administrator simultaneously enter changes to the customer record, the updated information input by the customer is transmitted to the ERP system before any relevant changes are transmitted from the ERP to the ecommerce portal. Real time integration allows both ends of the system to sync simultaneously, thus delivering the latest information to the customer and the enterprise. How Can the i95Dev Real Time Integration Technique Help Your Company? The i95Dev team is one of the industry’s most trusted authorities on integrating Ecommerce with ERP Systems. Our Point to Point real time integration technique allows your enterprise to utilize the most current information as it enters your network, whether it is from the customer, your suppliers or internal personnel. Our proven technique features greater flexibility and control to users while still maintaining a quick and easy implementation method. Our real time integration solutions are hard coded using extensions which have been developed using proprietary code and techniques, thus delivering a robust and cost effective method. For further information on our solutions please drop us a mail at info@i95dev.com or call us at 301.760.7499. We would be more than happy to analyze your requirements and provide you with the integration solution that best meets your needs and objectives.